Sunday dinners are a tradition in my house. 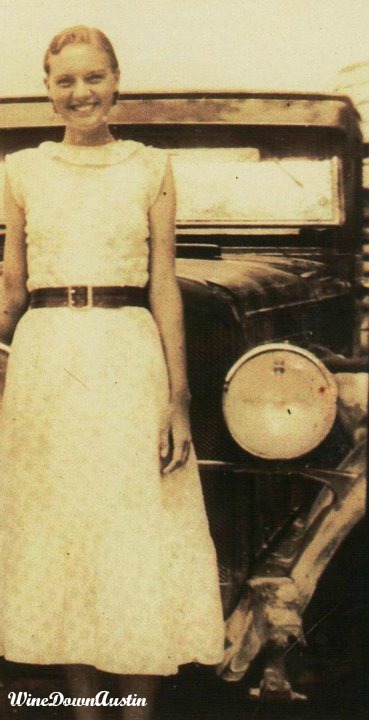 My Mamaw always made huge, home cooked meals on Sunday for the family. Sunday “supper” was a requirement if you were in town. Ham, pork chops, collard greens, and soft fried potatoes. Mamaw’s soft fried potatoes were legendary. Must have been that 30 year-old cast iron skillet seasoned with bacon grease! Sunday supper is a Southern tradition that never left me. This past week we decided to BBQ brisket and vegetables. The hubs and I have experimented with several different BBQ seasonings and techniques, but never quite found the right combination. We wanted Franklin’s quality, but kept getting dried out, over seasoned meat. This week we kept it simple: salt, pepper, and 18 hours in the pit over low heat. It was finally hug-yur-Mamaw good! Simple is always better! 1. Affordability-I don’t believe that wine has to be expensive to pair well with food or provide an interesting addition to the table. I like quality and value. 2. Flexibility- I like that some wines can be very complex and distinctive, but they do not always lend themselves to the modern table. 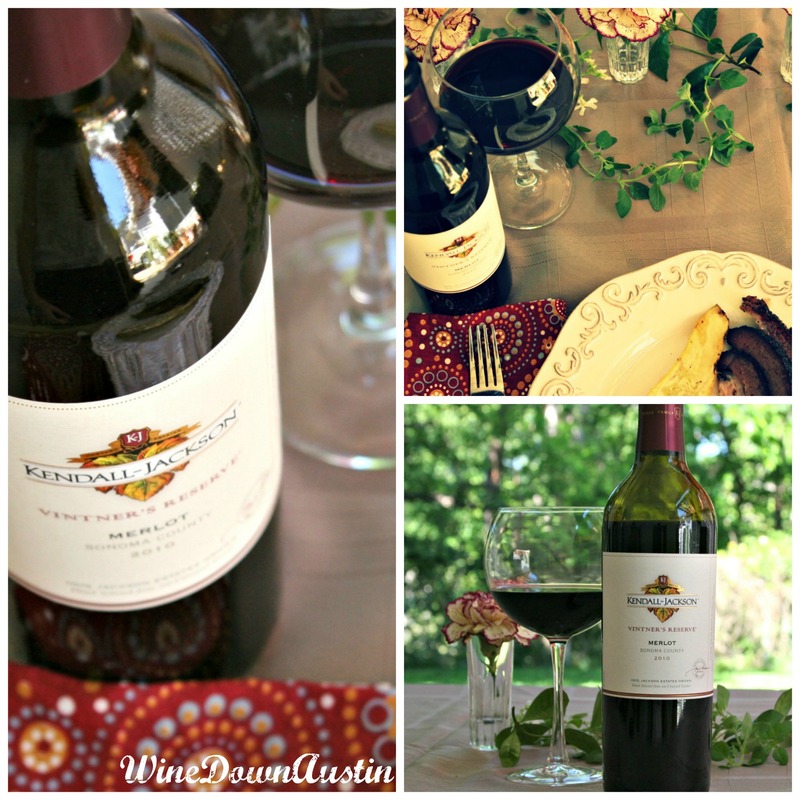 New world wines like Kendall-Jackson are flexible and can be paired with a variety of food. KJ has a good balance of fruit and spice. 3. And gosh darn it, it just tastes good! You should always drink what makes you happy! I thought the Kendall-Jackson 2010 Merlot would pair nicely with smokey BBQ. I picked a Merlot over a Zinfandel or Cabernet because I thought the mellow fruit would balance out the spicy BBQ. I did not want a smokey Zin to cover up the 18 hours we spent on the brisket! I don’t usually pair bold wines with bold food. With food, as in life, I need balance. The berry notes and dark cherries of the wine tasted like a light cherry wood smoke added to the pit during the last few hours. Not too fruit forward, but enough to appreciate its fragrant presence. 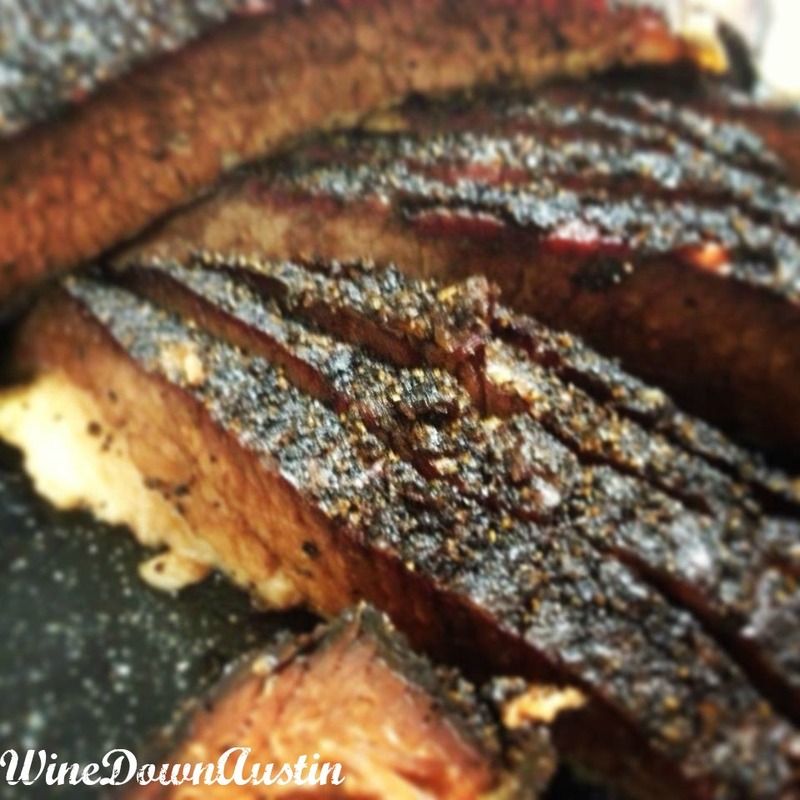 I was afraid the more exotic spice of anise would taste strange, but paired with the wine’s slate minerality, it allowed the brisket to take on a woody flavor. Dark and earthy. Natural and organic. Just the way good Texas BBQ should be prepared. I think the KJ Merlot could also be paired with my Smoked Honey Dijon Rack of Pork! I served grilled corn-on-the-cob and yellow squash which provided an interesting dichotomy to the spicy BBQ. The summer vegetables were sweet and the wine enhanced the fresh, garden flavor. Overall, I think the Kendall-Jackson 2010 Merlot is a great value and flavor for backyard BBQ’s. Because I was serving up Mamaw’s Sunday supper, I thought a reliable wine would be the best choice. Every meal is a feast when you have good wine at the table! *Disclaimer: All thoughts and opinions expressed in this post are my own. I was not provided samples or compensation so it is all about what I think! 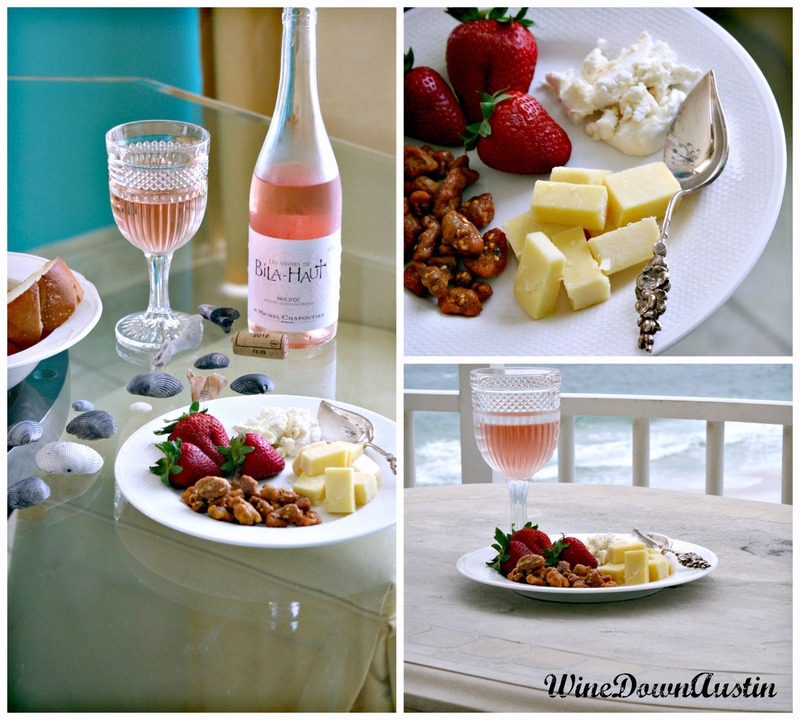 A seaside retreat is a beautiful backdrop for food styling practice. I am surprised that I like playing with food as much as I do. I am still learning and trying to get the right angles down. If anyone has advice let me know! And parents, don’t discourage your children from playing with their food. It might come in handy one day! 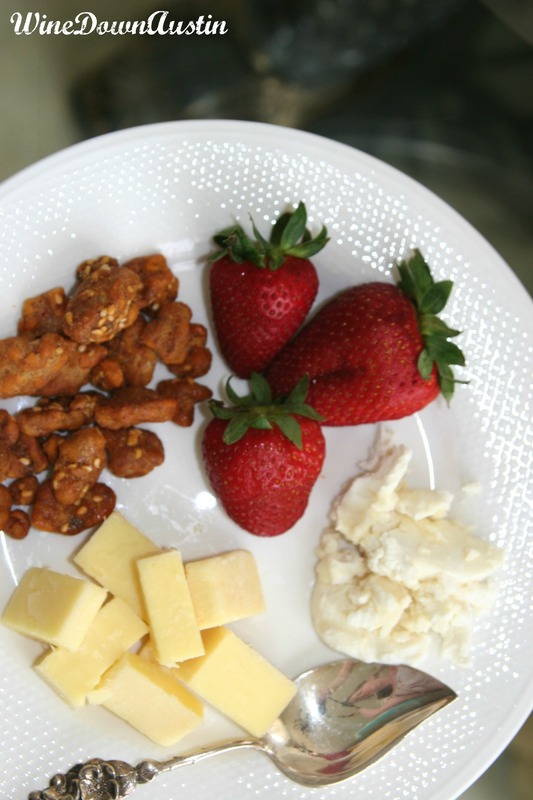 I went with the classic wine plate for this shoot: goat cheese, Irish cheese, fruit, candied walnuts, and bread. I had to set up inside as the weather outside prevented any attempt at a picnic in the sand. I’m still holding out today will be nice to try another shoot. 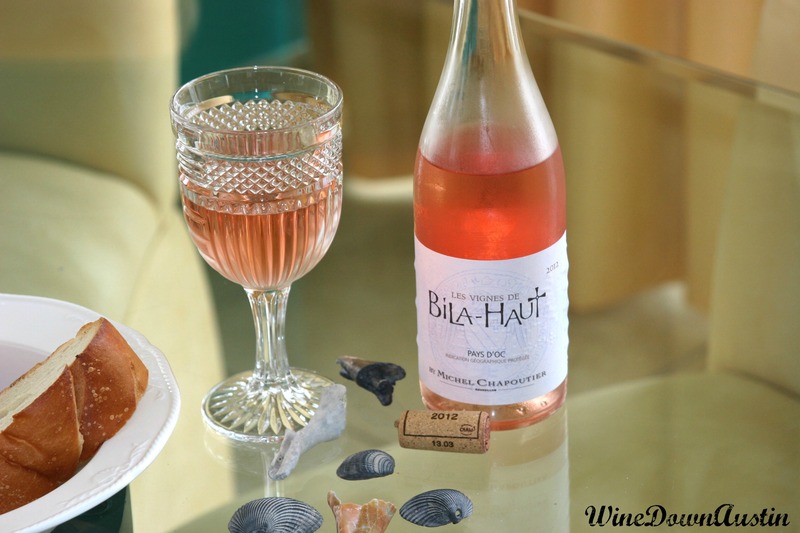 The 2012 Bila-Haut Rose was a nice addition to the table and a great value. I picked it up before I left Texas for about $10. Bila-Haut exhibited a strong berry flavor with hints of orange and watermelon. Because it has so much bright acidity up front, I would describe it as that first moment you walk out on a sunny day. You have to cover your eyes for a moment, but then it feels good to lift your face and soak up the sun. It was light, crisp, and the dryness offset the sweetness of the cheese. I would buy this wine again for a day at the beach or a warm afternoon on the porch. The 2012 Bila-Haut would also pair well with grilled lobster or soft-shell crabs. I wish I had more time to play around at the beach, but today is my last day. Boo! Tomorrow I head back to Austin to see the hubs and fat cats. Gulf Shores restaurant recommendations are next! In honor of Wine Wednesday, I decided to try my very FIRST wine video. I have never been particularly comfortable with seeing myself on screen so the video is pretty rough, but cheers to trying something new! I know it is World Malbec Day, but I didn’t have any at the house. SO. Today’s Wine Wednesday challenge was between Chateau Ste. Michelle and Kendall-Jackson Chardonnays. 1. RELAX…Easier said than done. I’ll have to turn the screen off next time so I can’t see myself stumble! 2. Invest in a video camera. It was difficult to show the wine because I was recording from my laptop. Videos at home would be easier with a dedicated space with decent lighting. I’ll see what I can do. 4. Have a rough script. Apparently, I like the words “very”, “really”, “ummm”, “a lot”, and “apricot”. I even meant to say pineapple for Kendall Jackson and I still said apricot. Ummmmm…. 5. Let viewers know the price. I drink wines from all price points so that would have been helpful (Btw, Chateau Ste. Michelle is roughly $10 and Kendall-Jackson $12 retail). 6. Interject a personal story or a picture in the video. I think it would be more interesting. 7. Try again next week! Some people despise birthdays. But I love them and birthdays should remind one to appreciate time, success, failure, and basically, just being alive. Moving, breathing, tasting, and experiencing. Birthdays are for living. I always try to take a few days and do things for me. It allows me to think about all the reasons that I love to be here, right now, working towards a life that will make me happy and proud. Turning 35 was a privilege! 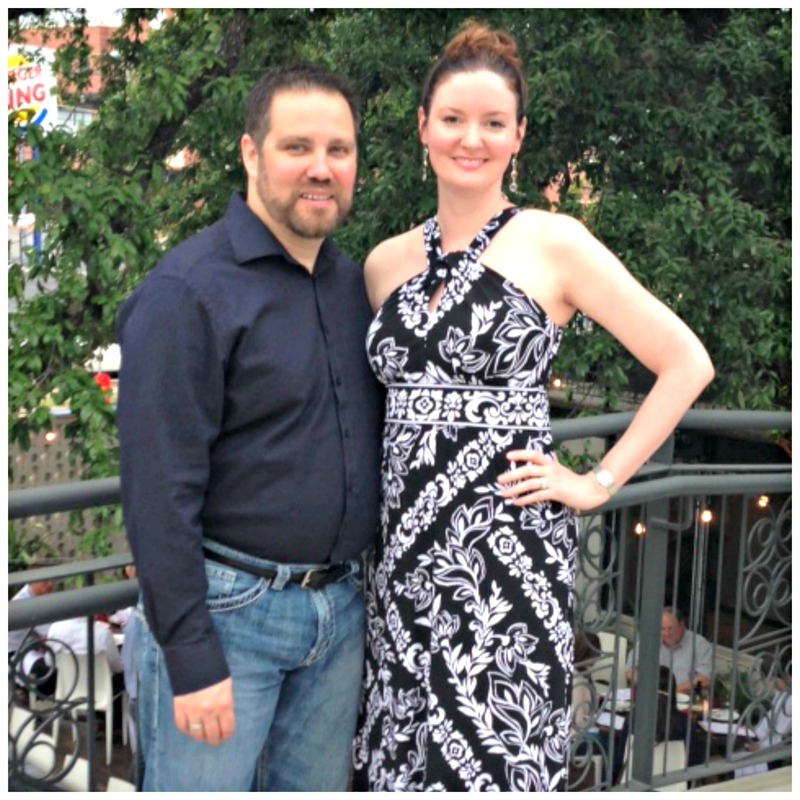 I started my weekend on Thursday night at the 2013 Austin Tastemaker Awards. Local restaurants, chefs, pastry chefs, sommeliers, bartenders, and craft brewers are nominated to be the Austin Tastemaker of the year. The 2013 nominees and winners can be found here. One of my favorite restaurants, Congress Austin, was nominated so I was very excited about trying their signature dish for the event. In fact, I was probably knocking people over trying to get to the booth. Congress served a slow poached egg with sausage and herbs. It was UH-mazing! My second favorite dish of the night was Lenoir’s curried goat, and incidentally, Lenoir won the contest. Overall, it was a great event and I am always happy to support the local food community! Friday was for relaxing, exercising, and happy houring. I TGIF’d Mexican martini style. Chuy’s Mexican martinis are a birthday tradition in these parts. Saturday, my husband took me to Olive and June. Olive and June serves Tuscan, farmhouse inspired cuisine using locally sourced ingredients. 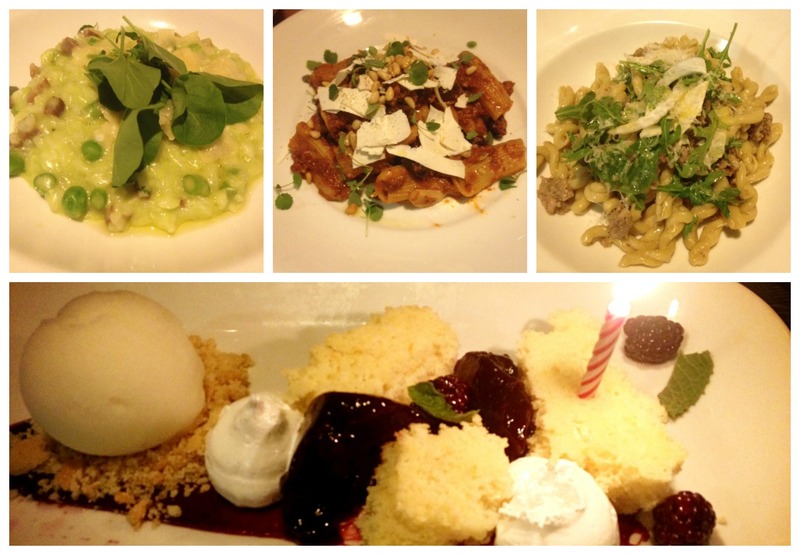 We ordered the spring vegetable risotto, rigatoni, and gemelli for dinner with the citrus torta for dessert. It was, as always, fantastic. Italy is one of my favorite destinations so any place that serves Tuscan inspired food will always have me as a customer! Watch out-carb overload! Sunday, my actual birthday, was spent relaxing with friends. The weather was divine so I had to spend some time outside porchin’. If you have been reading my blog, you know porchin’ is serious business at my house. 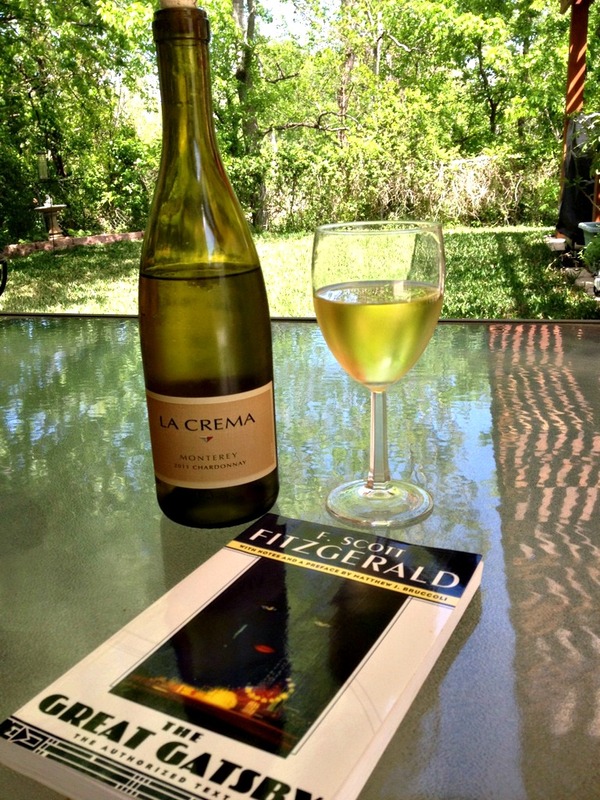 La Crema was today’s porchin’ wine accompanied by F. Scott Fitzgerald. Can’t go wrong with Chardonnay and The Great Gatsby. I am firm believer that drinking wine while reading the classics will make the experience greater. I have to say it was an amazing birthday spent celebrating, appreciating, and soaking up fun with people that I love. And that’s all I really wanted or needed. Porching in Texas, especially Austin, is practically a way of life. 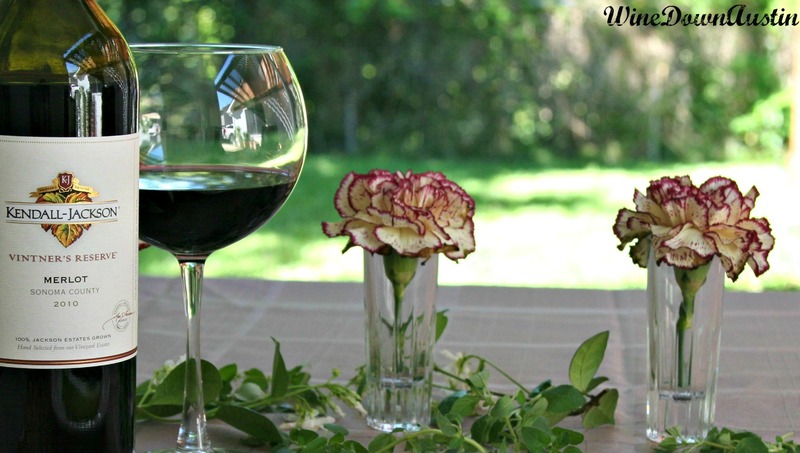 I live on my patio in the spring/summer time and love to enjoy a refreshing glass of wine after work. Today, I opened a bottle of wine I picked up in France: Les Caillardieres by Domaine du Closel-Chateau des Vaults. I was introduced to Les Caillardieres while visiting and working with Chateau des Vaults during my MBA program last summer. This is my last bottle of Chateau des Vaults wine so I guess I will have to go back for a visit soon! Domaine du Closel is a family run business in Savennieres, France. 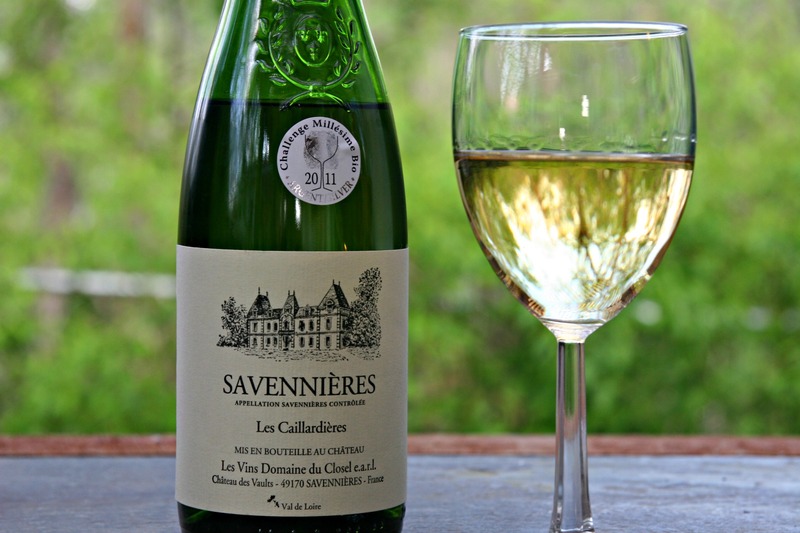 Savennieres is located in the western part of France in the Anjou-Saumur region of the Loire Valley. The history of Domaine du Closel and wine production date back to 1495! Its mission is to provide high quality, rare, organic wine and provide a cultural experience for wine drinkers. Les Caillardieres is produced in a sandy vineyard on top of the hill of the estate. Les Caillardieres is produced with Chenin Blanc grapes and the estate has unique geological influences (slate, volcanic stone, minerals) that give the wine a distinct flavor. The flavor profile is very intense with lots of floral notes and dried fruit. The wine has a long finish and holds up well against food. I paired it with a crab, avocado, and tomato salad and the lime juice I used in the salad really brought out the citrus tones. It reminds me of warm weather and picnics on the porch! I just love it. I have not found Chateau des Vaults wines anywhere in Austin except at Vino, Vino for a very brief time. I hope more wine bars will do their homework and discover less known wines. The small, family run businesses often do not have the budget to promote or hire a professional in order to capture a larger market. They rely on agent promotion and word of mouth. And so, here is my plug for Domaine du Closel wines. If you have the ability to order from Louis Dressner or your importer-do it! The wines are interesting, refreshing, satisfying, and pair well with salads, seafood, hard cheeses, and chocolate! 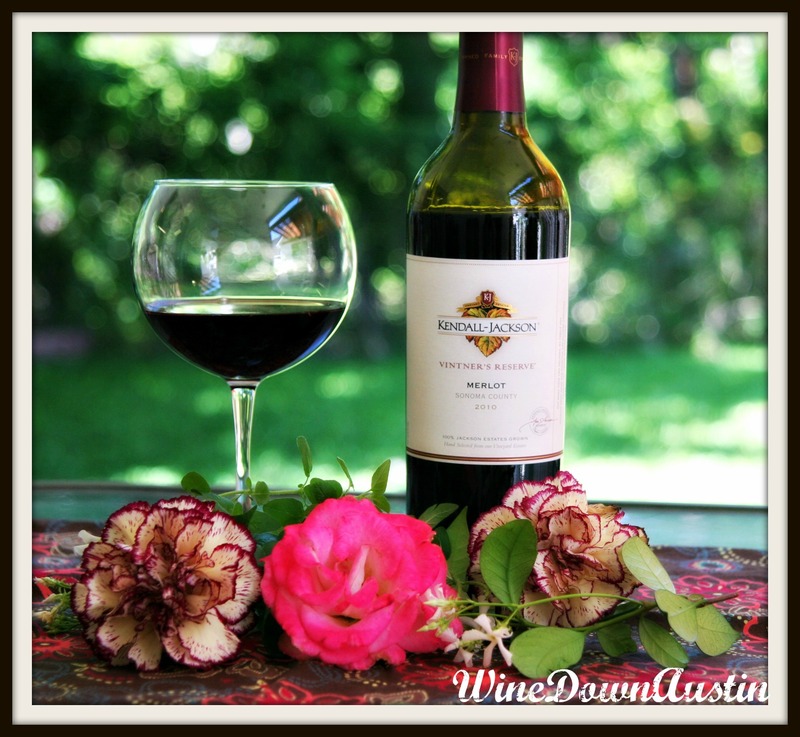 Pour yourself a glass, sit on the porch, and Winedown!